Today is the last day of our Thunderbirds Pinball machine extended 12 months warranty - it means purchase (or pay a deposit) a Thunderbirds Pinball machines before end of 30th November, 2018 and receive 24 months warranty on ALL components. Thunderbirds Pinball is ready to go with a new dedicated live website. It contains information on all things Thunderbirds Pinball related including features, service, news, contact information and where to buy. 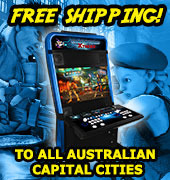 We don't have enough time to individually add all machines but pickup clearance arcade machines across Australia including games such as ICE Cyclone machines for $750aud including tax. Highway Entertainment are happy to announce a new website has been made available to customers to address any questions or trouble shooting concerns surrounding their machines. Highway Gaming will be used as a tool to help customers with the setting up, updating, and game play of their individual cabinets. Taking place over September 22 and 23, all proceeds raised from Pinfest Newcastle are to be contributed to local charities. This year 900 people bought tickets to the 2 day event, generating approximately $12,000. These funds are to be divided between The Westpac Rescue Helicopter, Hunter and Northern Kidney Association and Wesley Mission Newcastle. Arcooda's Video Pinball Ultra machine will be on display at Sydney's Australasian Gaming Expo starting tomorrow and spanning over August 15 and 16. Arcooda's machine is the first licensed video pinball cabinet to be sold on the market as plug and play ready. The company have also worked alongside Farsight Studios (the makers of Pinball Arcade who recreated games such as Addams Family and Medieval Madness for video pinball on mobile, PC, XBOX etc) to create a full-sized video pinball table with back-glass and DMD support. Australian customers will have the opportunity to experience the first production model of Homepin's Thunderbirds pinball game in Sydney this month. The arcade machine, based around the 1960's show of the same name will appear at Sydney's Australasia Gaming Expo on August 14 to 16 set at Darling Harbour's ICC Centre. Looking to purchase a Game Wizard Xtreme, Game Wizard for Android and Touch Wizard? 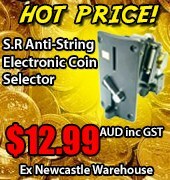 Enjoy free shipping to Australian capital cities. Offer ends June 30th 2018. We are excited to announce that Highway Games will be working with Homepin in their showcase of Thunderbirds Pinball at the Asian Amusement and Attractions Expo (AAA) on the 3-5 of April in Guangzhou, China. Come along to the event and enjoy the final version of Thunderbirds Pinball. On the 15 and 16 of July, Arcooda will showcase the Touch Wizard Pinball Arcade. This desktop arcade machine is truly an innovation and there is nothing like this out there. 70+ Pinball games at your fingertips and more through the Google Play Store. Arcooda has just introduced a LCD Coin-op Timer Board. This New add-on for the Game Wizard Xtreme, which adds more customization features to this already versatile machine. This feature will allow for free play or time per coin. Some Other Features include, your own welcome screen, lights that not only attract the eye, but inform the people on how much time they have left. Our End of Financial Year Sale is now underway! Check out the exorbitantly cheap prices for the best End of Financial Sale in Arcade gaming, with cabinets starting from as little as $49. Arcade cabinets have never been so affordable so there is no better time to get in and get a fantastic deal, while stock still lasts. As the new Initial D Arcade Stage Zero is coming soon, this is your chance to get a great deal on Initial D Arcade Stage 8 Infinity Driving Machines. There is a special clearance price and you have the option of purchasing one twin machine or a container of machines. Furthermore, there is the choice to purchase as-is (straight from the arcade venue in Japan) or as a fully refurbished machine. Highway Entertainment is giving away a double pass (two tickets) to the 2016 IAAPA Attractions Expo trade show. Arcooda arcade machines due to be released in the next two months will be distributed throughout Australia by Highway Entertainment. We are pleased to announce that we will be exhibiting at Pinfest 2016 on the 24th and 25th of September at Caves Beachside Hotel. This is the 5th year of "flipping fun" thanks to Newcastle Pinball Association, and this is where we will be presenting the full features of the new and truly innovative Arcooda Video Pinball Machine. This is something you do not want to miss! If you have been following us on Facebook, you would have noticed our recent competition that is running until the 29th July. We will be inviting 10 lucky winners to our headquarters in Newcastle to preview Arcooda's exclusive, never-before-seen multi-platform machines!